The rapid advance of technology forces marketers and creators to reinvent the way they produce content more quickly than ever before, but the goal remains the same: Tell a great story that captivates and informs. 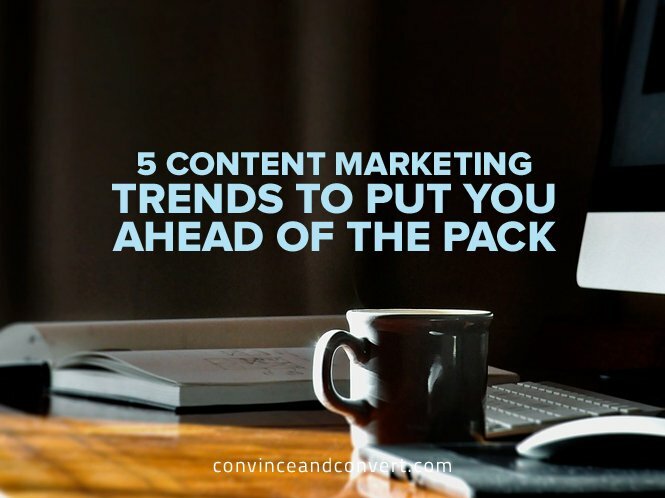 With that in mind, here are five emerging trends that’ll help give an edge to your content marketing strategy. Many people now get their news exclusively from Facebook. Not surprisingly, publishers are increasingly tailoring their content specifically for social platforms, thanks to fast-loading, ad-friendly editorial formats such as Snapchat Discover and Facebook Instant Articles. This approach is now being adopted by brands. Last October, Sony Pictures became the first brand to purchase its own Snapchat Discover channel, which was dedicated to the latest James Bond movie, Spectre. Meanwhile, Facebook recently announced that it would be making Instant Articles available to brand publishers. This means that marketers will have to adapt their content for these enhanced social formats, which means effective and entertaining vertical video on Snapchat, stunning motion photography for Instant Articles, not to mention content that generally sparks discussion and sharing. Given their sheer number and audience (WhatsApp alone has one billion users), messaging platforms like Facebook Messenger, Google Hangouts, and iMessage would seem like a no-brainer for content creation, but their lack of trackability has kept most publishers and marketers away. Now that there’s too much content everywhere else, though, “dark social” is suddenly the new frontier. Facebook is making the bold move of actually inserting ads into Messenger, but the future may require a more subtle approach. Already many marketers are working with chatbots and branded emojis. For a taste of what content creation using the chat idiom can look like, look no further than the Quartz app for iOS, which reimagines the news as an IM conversation, complete with GIFs, emojis, and dialogue. The extreme popularity of Instagram and Snapchat demonstrates that people prefer to interact by visual rather than written means. The brain can process pictures much faster than words, which is probably why visual content is 40x more likely to be shared on social media, and content with images gets 94% more views than content without. Images and other visual media—and this includes video, infographics, GIFs, and emojis—provoke an instant emotional response, allowing for a stronger brand connection. They’re an essential element of any savvy content marketing strategy. This Podio infographic, for example, delivers data about work habits of famous figures in a way that’s fun, engaging, and slick. User-generated content (UGC) has emerged as a powerful format for marketers. The rise of the empowered consumer has led to customers wanting to be part of the entire brand experience, including marketing. The most popular brands on social media are the ones that interact with their customers the most. They aren’t seen as detached companies delivering one-sided marketing messages; rather, they’re organic communities that customers can be a part of. This approach is why UGC campaigns are seeing such success, whether they’re user-submitted street photography or customers’ own artwork. As with so many other businesses and disciplines, content creation has undergone unprecedented disruption now that technology is an integral part of any storytelling platform, and the relentless evolution continues on a daily basis. Brands that understand what’s next and are willing to experiment in the latest and greatest storytelling arenas will not only have an edge—the early bird often gets the worm where next-gen tech is concerned—but will also help pave the way for content marketing’s continued success in the future.